Lubetech Spill Control products were established in 1997, Lubetech have grown to become the market leading and nationally recognised brand for spill control products. 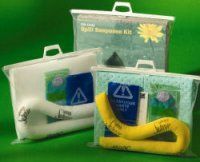 Lubetech's extensive range includes absorbents, spill kits inc chemical spills, drain protection and drum storage products. Lubetech spill response for the enviroment. They have now launched a new environmental range called Natural LT.
Lubetech have now launched their SPILL DEPOT Storage & Dispensing Unit System to provide their customers with a safe way to store and dispense Lubetech absorbents in the workplace. Site visits can be arranged, we will show you a saving on your current brand. Reducing your use of non-sustainable products.